Needing a bit of “Time Out”, Nan and I decided to have a short break just on our own; a location that appears not to offer too much for the masses was needed. Fortunately we knew of just the spot; this being the saddle just north of the Mt. King Billy One. 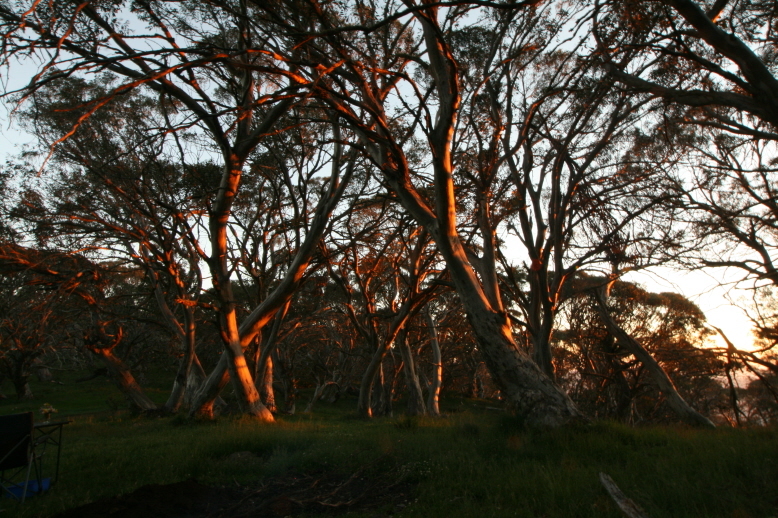 Previously we had camped at 1650 metres amongst the snow gums with pristine spring water available only a short walk away from the headwaters of a tributary of the Macalister river. 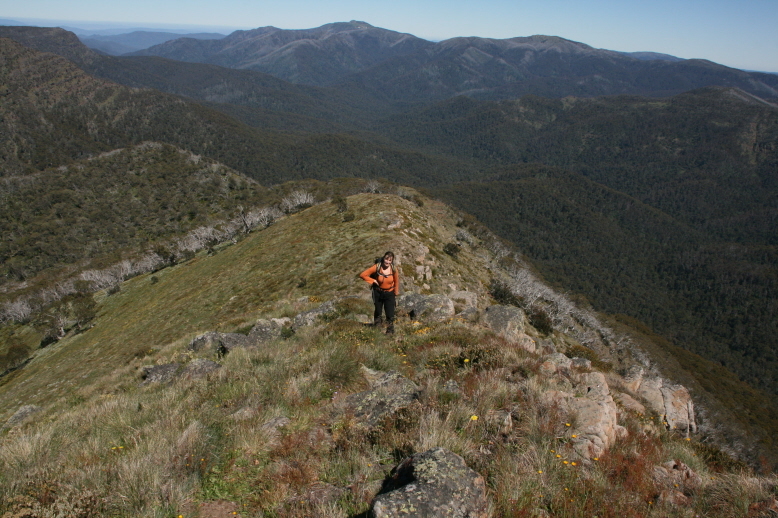 The location offers great views, some good walking on the Alpine Walking Track (AWT) plus some SOTA summits. The walking track to Mt.King Billy One summit is moderate. Walking amongst the snow gums at first, the track climbs up some rocky knolls than some rock hopping on the exposed ridge line before a short scramble to the summit where there is a cairn. No trees on the actual summit which is a flat plateau. 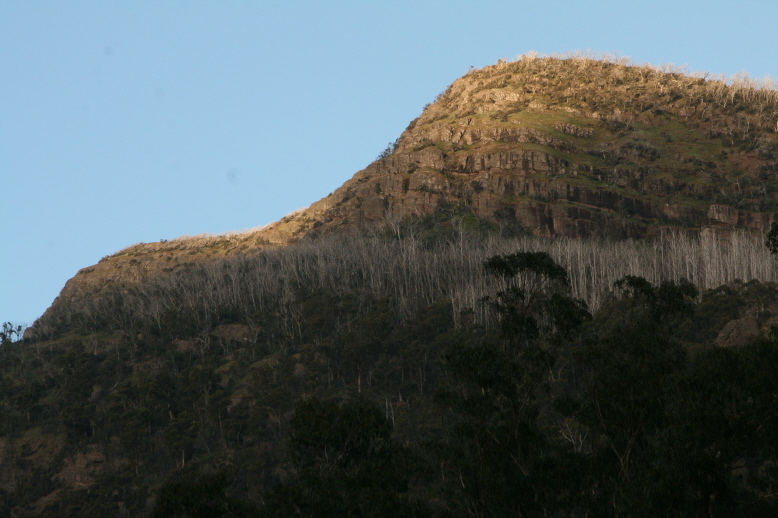 The S/E side facing the Macalister River is quite exposed but offers limited operating positions in partially sheltered saddles below the summit. The opposite side is very scrubby and has many more trees. 12/27/2013 Mount King Billy One VK3/VE-016 10 of 10 points I was to activate this summit 6 times in the coming days. In the mean time, whilst setting up our camp site I worked vk3s YY, ATV and KAB located on Mt. VK3/VT-002 Reynard. A sked was arranged for a follow up call on 2 metres FM from the summit of King Billy One. The walk from the camp (well more like a run) took 10 minutes and I bagged all three for S2S contacts using the Yaesu FT470 HH. Back at the camp, I also worked VK3PF, VK3XL and VK5BJ on 40 metres. I was back on the summit of the next calendar day (same UTC) at 23:00 hrs. First contact was with Glenn VK3YY who had moved to Trapyard Hill VK3/VT-005 followed by 5 x 40 meter CW contacts Including S2S Warren VK3BYD onMt. 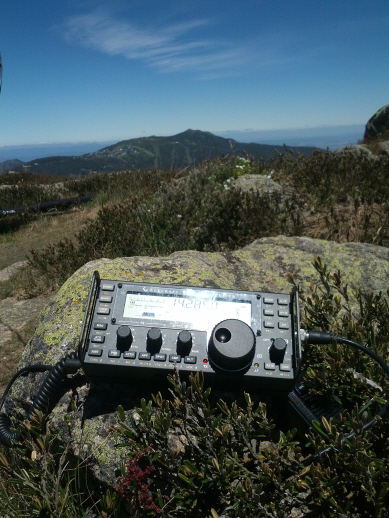 VK3/VE-004 and 12 x SSB contacts that included the S2S with Brian VK3MCD on Mt. Major VK3/VU-011. Post UTC I worked Warren VK3BYD again as well as VK2JOS on VK2/HU-065. 12/29/2013 saw another mini-expedition with the hand held to work VK3ATB and VK3KAB who were now also on Trapyard Hill for another couple of S2S contacts. 29/12/2013 Mount Lovick VK3/VE-020 10 points Activation time 29 minutes – long walk home! Following the brief morning activation of Mt. 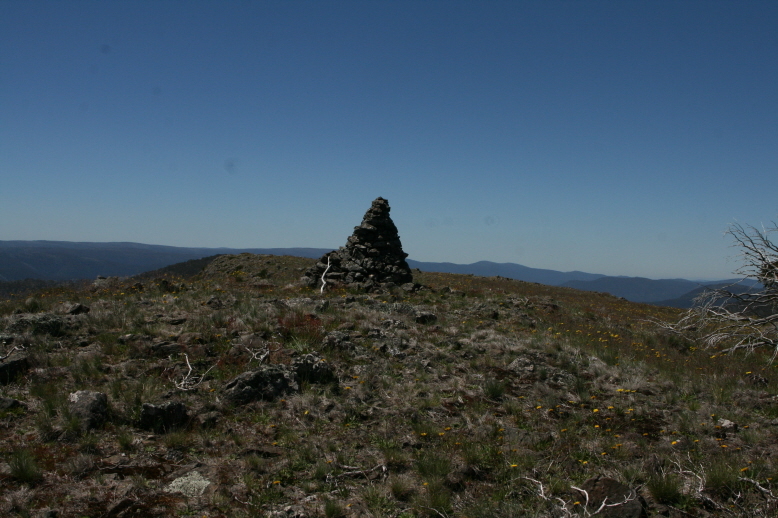 King Billy, Nan and I walked the 4WD track across the ridge line past Lovicks Hut to Mt. Lovick. I had driven this a number of times, it is quite rocky with a reasonable climb (for walkers) out from Lovicks Hut (re-built since the fires). The walk in took 2 hours & 15 minutes but on the return, we picked up the old fire track on the LHS that is a much more direct route down to Lovicks hut. This took about 20 minutes off the journey and was a more pleasant walk on the road. As with the walk in, we also picked up sections of the old track on the way out from Lovicks Hut. 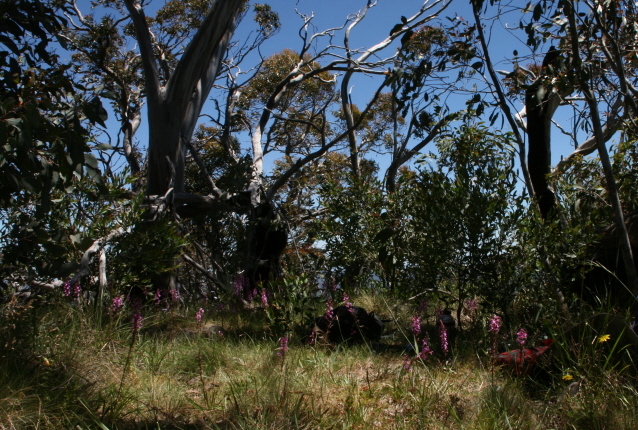 29 / 30/12/2013 Mount King Billy One VK3/VE-016 10 points Activation time 1 hour 46 minutes. An easy day in the camp today. Activation technically began on the 29th at 23:45 hrs with 6 contacts. For some reason I can not get these 6 contacts to show on the online log. Possibly due to my earlier mini-activation on the same UTC day? Broke the squid pole today when the pile of rocks supporting it gave way; smashing the upper section. Fixed with Gaffer Tape. Should have used the spike! Anyway, a further 32 contacts on 40 meters SSB with S2S VK2FPJ ten VK2/IL-004 Phil Marshall VK3MRG on VK3/VG-001, Peter VK3PF on VK3/VE-025, Gerrard VK2IO ON VK2/HU-093, Rod VK2TWR VK2/SM-022, Allen also on VK3/VG-001 to VK3HR, Andrew VK3ARR VK3/VC-032, Ron VK3AFW on VK3V E-008, and Brett VK2BNN on VK2/CT-004. Had a further search for the spot – re-walking the track and then across the spur linking all the King Billys. Not much of a track Between the two peaks. No sign of the spotlight! Nan trekking up Mt Magdala. Mt. Buller in the back ground. Nan and I first walked to Mt Magdala (The more common name) over Easter in 1986. This was the ill-fated series 2A Landrover trip (cooked, the alternator) when we were also in search of Haley’s Comet. We continued past the summit to view Hells Window – a natural break in the rocky ridge line is ob viewing the Howqua Valley towards Mt. Buller and then returned. The walk is a steady decline on the Alpine Walking Track followed by a serious climb out of a saddle to the summit. Climbing out above the tree line became quite hot. We were blessed with the alpine meadows being covered with a late spring alpine daisies. It was wonderful lying on the grass simply taking it all in.. No. wind which is always good! Distance about 3.5 kms. Track starts at 1650 metres, descending to 1450 metres than ascends to 1720 metres. Operating 40 meters CW produced four contacts including a S2S with Wayne VK3WAM on VK3/ VT-009. A further 14 contacts were had on 40 metres SSB including a S2S with Marshall VK3MRG on VK3/ VE-001. This is the big one. The scene was set with a huge number of activators out on summits. Being on the summit over the UTC New Year roll over allows an activator to claim the activation points for both the current and the new year plus pick up a pile of S2S points. I was not disappointed. The only concern was the weather. The sky was ominously overcast, the cold and gusty winds from the south west. Bands of heavy rain could be seen on the adjacent mountain tops and the horizon was often blocked out with heavy dark cloud. This time I set up in the sheltered area on the east side of the summit, The 40 metre band was very busy and it was difficult to find a clear spot. Instead I spent much time moving about whilst working on the other activators. Pre UTC: 17 contacts, 11 S2S. They were (CW) Wayne VK3WAM on VK3/VT-037, (SSB) Andrew VK3ARR on VK3/VC-030, Al VK1RX on VK2/ST-034, Ron VK3AFW on VK3/VE-008, Allen VK3HRA on VK3/VS-002, Ian VK5CZ on VK5/NE-058, Marshall VK3MRG on VK3/VE-014, Phil VK2FPJR on VK2/IL-002, Joe VK3YSP on VK3/VC-014 (with Julie VK3FOWL) and Nic VK3ANL on VK3/VC-034 .. After the roll-over new years, 11 stations were worked, all S2S. Nic VK3ANL. Ron VK3AFW, Al VK1RX, Andrew VK3AR, Andrew VK1NAM on VK1/AC-038, Marshall VK3MRG, VK3HR Allen and Joe VK3YSP, Peter VK3PF on VK2/RI-035, Wayne VK3WA M (CW) and Ian VK5CZ. With the closing of WX, a hasty retreat was made ​​back to camp and everything was battened down,Nan and I jumped in the car for a day trip over to the Howitt Hut. This also gave an opportunity to charge the batteries. The King Billy Saddle track from the turn off to the Macalister Springs is rough and slow going complete with a few small river crossings. Recommended FWD only. 02/01/2014 Mt. Lovick VK3/VE020 10 points. Activation time 6 Minutes. Nan and I were actually en route by car to the Bluff when it disappeared into the rain clouds in front of us. The Bluff would have to wait. Instead, being just past the Mt. Lovick turn off, we had an extremely quick activation before the bad weather hit. All four contacts on 40 meters SSB including a surprise first up S2S with VK5STU Stuart . Back at our camp, we decided to pull out and find a more sheltered camp site down in the Valley. We descended via the Cairn Creek track to the Jamieson River. Our first option campsite at Lower Saddle Road was closed but a nice camp in a new area complete with table and fire pit. With the weather clearing a bit but still very cool for summer, we planned to activate Rocky Ridge and then head up to the Bluff. Rocky Ridge is accessed off the Bluff Link road near where it intersects with Refrigerator Gap Track (which we used to come up on). The later is a good 2WD gravel road and is accessible all year round. From here, the alleged walking track heads up onto the 8 mile spur before descending to the main road (at either 8 miles Gap or even further down with the Howqua River Walking Track). I say alleged for in reality it is a myriad of cattle tracks through scrub and burnt trees. The best bet is to use dead reckoning. Follow any tracks that lead up to the main ridge / escarpment (NNW) and then follow generally SW. Easiest bath is a little down from the ridge top. Walking time was an hour. Distance of about 1 km, elevation gain of 240 meters. Sitting on a rock in the sunshine whilst Nan read her book, the summit was soon qualified for the first time. All contacts were on 40metres SSB (CW paddle defective) that included S2S with Steve VK3JY on VK3/VN-001 JY, Rod VK2TWR on VK2/SM-068, and Andrew VK1NAM on VK1/AC-031. 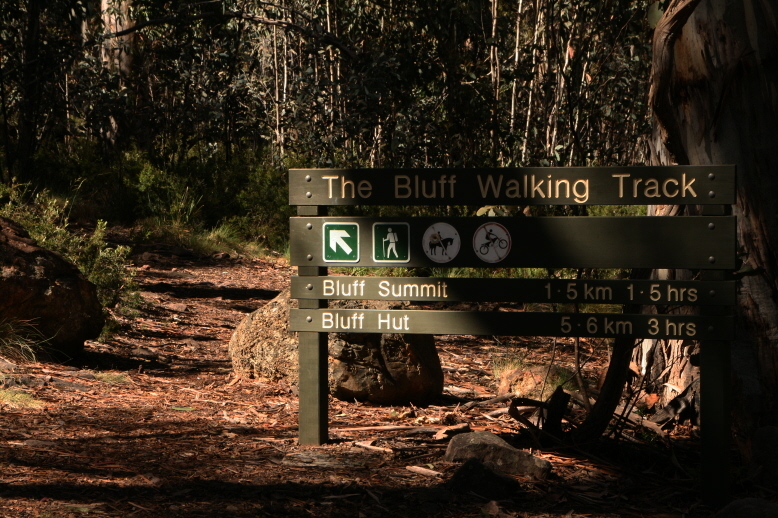 The Bluff VK3/VE-013 10 Points 05/01/2014 . Activation time 6 minites Nan and I had lunch at the carpark located at the start of the walking track. This is just off Bluff Link Road. Concerned about a possible wind shift, I parked the car clear of the towering gum trees. The signage Indicates no mountain bikes or horses. I know why! The track starts off moderately enough but before longsome serious climbing begins. The route is only 1.5 kilometers, The elevation gain is 450 meters and took 1.5 hours to ascend,. Before breaking through the narrow gap in the escarpment, much rock hopping and minor vertical climbs are required. The squid pole was a real pain, not to say the DSLR camera. Take careful note of the saddle where the track breaks through the escarpment. It is not well defined or marked. I referenced it with the summit of Mt. Timber Top in the background. From this saddle, it should be a moderately easy walk to the summit and cairn. I say should be because of the wind and cold was cyclonic. Being hot from the climb up we quickly donned our wind jackets and warmer clothing. It was scary and Nan headed back down. I set up just below the summit. Not being able to hold the pole up squid, I attached each end of the doublet to low bushes no more than 1.5 meters high and threw the feeder up in the air. It took off like a kite w I set up where the end landed. A very minimal operation, running off internal batteries and getting the minimum of gear out as possible. Not even trying to spot myself, I broke in on Glenn VK3YY / P on VK3/VT-079 for an S2S. Glenn allowed me to use the frequency to obtain the 4 contacts required to qualify the summit. This included a second S2S with VK2FGJW on VK1/AC-035 . Others were worked to VK3BHR Phil and Peter are VK3FPSR. A hasty retreat was made in only 40minutes back to the carpark. Lost the camera lens cap somewhere! 07/01/2014 Mt. 10 Points Stirling VK3/VE-011 . Activation time 23 Minutes With holiday break nearly behind us, we headed towards home. But first off was to pick up a bag of cow manure courtesy of the cows near Rocky Ridge and then activate Mt. Stirling – access off Monument Track and the Clear Hills Track (both seasonally closed). With 4WD access right up to the saddle below the summit, this one was easy. Parking the car below the summit and descending some way to clear the activation zone, in perfect weather and coffee in hand we walked up to the summit cairn, 17 contacts on 40 meters SSB Including 4 S2S. They were Glenn VK3YY on VK3/VT-060 VK3YY, Andrew VK3ARR on VK3/VC-019, Andrew VK3NAM with Greg VK2FGJW both on VK1/AC-036 . We headed off to Mount Buller for lunch FWD via the link road (so close to another summit!) And than to home. The summer break is over now and and activation periods. For the record, during this time I activation amassed 70 activator points, 339 S2S points and 276 chaser points. Generally, with a few exceptions, the radio gear at camp was not in use and there was limited or no phone coverage. Thanks Nan for your company and tolerance . PS: apologies for any errors. WordPress managed to translate this post into another language, causing quite a few strange edits!